Nursing Knowledge: Science, Practice, and Philosophy - Heimkaup.is – Matur, raftæki, snyrtivörur, bækur, íþróttavörur, leikföng og sjónvörp. Allt sent heim samdægurs. Nursing Knowledge begins with philosophical problems that arise within nursing science. It then considers various solutions with the help of philosophical ideas arguingargues that nurses ought to adopt certain philosophical positions because they are the best solutions to the problems that nurses encounter. The book argues claims that the nursing standpoint has the potential to disclose a more complete understanding of human health than the common disease-and-dysfunction views. Because of the relationship to practice, nursing science may freely draw theory from other disciplines and nursing practice unifies nursing research. By redefining theory and philosophy,With a new philosophical perspective on nursing science, the so-called relevance gap between nursing theory and practice can be closed. The final chapter of the book ‘redraws the map’, to create a new picture of nursing science based on the following principles: Problems of practice should guide nursing research Practice and theory are dynamically related Theory research must provide the knowledge base necessary for nurse interventions, training, patient education, etc. Nursing research should develop midrange theories and its results are nursing theory is strengthened when it uses theories confirmed by is integrated with other disciplines Key features Clear and accessibly written Accurate and philosophically well-informed, Discusses philosophical problems in contexts familiar to nurses Systematically examines the philosophical issues involved in nursing research Examines epistemology (how we know what we know), theory development, and the philosophical foundations of scientific methodology. 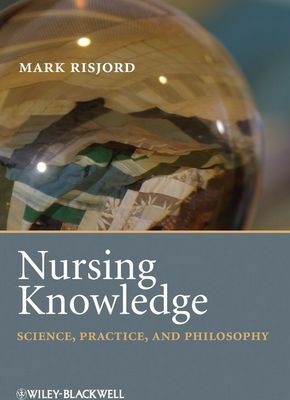 Develops a new model of nursing knowledge Dr. Mark Risjord is Associate Professor in Philosophy at Emory University, and has a faculty appointment in the Nell Hodgson Woodruff School of Nursing. His main research areas have been in the philosophy of social science and the philosophy of medicine. He was invited to has been teaching philosophy of science and theory development in the new PhD program in the Nell Hodgson School of Nursing at Emory University insince 1999.